Fujifilm has announced more details about upcoming accessories that will be available for the newly released interchangeable lens camera, the X Pro 1. As well as a small grip to give better purchase on the body, a flashgun called the EF-X20 has been unveiled. Designed to compliment the X-series and with a guide number of 20m, the flash features automatic and manual control which is selected via a dial on the top. Anybody with existing Leica M lenses, or with a strong urge to buy some, will be pleased as it has been revealed that an M mount adaptor will be available. This means that photographers will be able to invest in a camera body which is expected to be only a fraction of the price of the M9 while still using Leica optics, which are famed for their high quality. For mere mortals without extremely deep pockets, several more lenses will also become available this year and in 2013. First up are a 14mm and 18-72mm f/4.0 zoom lens. In 2013, two more primes in the shape of a 28mm f/2.8 and 23mm f/2 will be joined by a 70-200mm f/4.0 Image stabilised and 12-20mm f/4.0 image stabilised lens. All of the lenses are subject to change depending on customer feedback, so don't send your pre-orders in just yet. 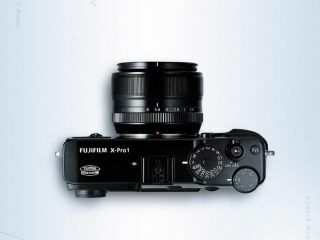 The X Pro 1 is Fuji's first interchangeable lens camera since 2006 and features an APS-C sized sensor which thanks to technology drawn from the firm's analogue heritage is apparently capable of out resolving a full-frame sensor. As yet there are no prices available for the camera, lenses or accessories.